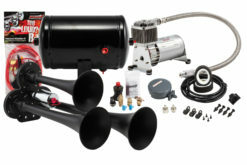 If you’ve got a vehicle, we have an insanely loud Kleinn ProBlaster ™ air horn system for it. Everything needed for a complete installation is included. All Kleinn ProBlaster ™ compressors are sealed – which means they are perfect for mounting either in or under your vehicle. In addition, all are equipped with a remote air filter snorkel system that extends the life of the compressor by providing clean, dry air no matter where the compressor is installed. Our most compact air horn kit. Two chrome all-metal trumpets 8.5” and 6.5” in length. Compact with high pitch, painful sound. Includes an easy-to-fit 120 PSI, 0.5 gallon air system. Dual chrome truck horn with all-metal trumpets 16.75” and 14.5” in lengths. Think fire truck or ambulance horn but LOUDER! Flat mounting design allow for easy mounting behind the grille, engine compartment, or on frame rails. Includes an easy-to-fit, 120 PSI, 0.5 gallon air system. Also available in black XCR2.0™ finish (P/N HK2-1). Dual black truck horn with all-metal trumpets 16.75” and 14.5” in lengths and black finish. Think fire truck or ambulance horn but LOUDER! Flat mounting design allow for easy mounting behind the grille, engine compartment, or on frame rails. Includes an easy-to-fit, 120 PSI, 0.5 gallon air system. Available in chrome finish (P/N HK2). Compact chrome triple train horn with all-metal trumpets 14.25”, 11.5”, and 9.25” in length. Produces a startling blended three-tone blast – guaranteed to get attention. Includes an easy-to-fit, 130 PSI air compressor and 1 gallon tank for more blast time. Also available in black XCR2.0™ finish (P/N HK3-1). Compact black triple train horn with all-metal trumpets 14.25”, 11.5”, and 9.25” in length with black finish. Produces a startling blended three-tone blast – guaranteed to get attention. Includes an easy-to-fit, 130 PSI air compressor and 1 gallon tank for more blast time. Also available in chrome finish (P/N HK3). 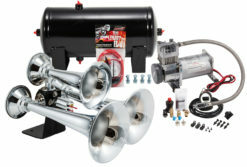 Quad chrome air horn with four tuned trumpets 13”, 11”, 8.5”, and 7” in length. Additional trumpets create a more fully-blended tone while being compact enough to fit almost any vehicle. Includes an easy-to-fit, 130 PSI, 1 gallon air system. Also available in black XCR2.0™ finish (P/N HK4-1). 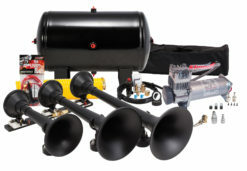 Quad black air horn with four tuned trumpets 13”, 11”, 8.5”, and 7” in length with black finish. Additional trumpets create a more fully-blended tone while being compact enough to fit almost any vehicle. Includes an easy-to-fit, 130 PSI, 1 gallon air system. Also available in chrome finish (P/N HK4). 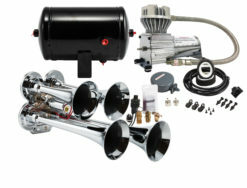 Complete oscillating dual air horn system. Sounds like a European police car.. Includes a 150 PSI, 1.5 gallon air system and all parts needed for installation. Dual black ABS trumpets are 15.5” and 10.5” inches in length. Trumpets mount separately, each with its own mounting bracket & solenoid, making then easy to install & freakishly loud. Designed for extreme durability, easy fit & extreme sound. Includes a 150 PSI, 1.5 gallon air system and all parts needed for installation. Three tuned trumpets, 16”, 14” and 11” in length. Chrome-plated high impact ABS construction. There’s no mistaking the genuine train horn sound of the HK6. When these horns sound off, you’ll swear that you’re standing on the tracks. Includes a 150 PSI, 1.5 gallon air system and all parts needed for installation. The Beast™ Model 230 black ABS triple train horn on flat rack mount. Three tuned high impact ABS trumpets 17.5”, 14.5” and 11.5” in length. Requires 40% less clearance than other full size train horns. Trumpets can be separated from the bracket for easier installation in vehicles that could not otherwise fit full sized train horns. Includes a full onboard air system with 100% duty cycle air compressor, 3 gallon tank, bonus tire inflation kit with storage bag. Can power your horns & other accessories like air bags and small air tools. Three chrome trumpets 17.5”, 15.5”, 11.5” in length. Flat rack detachable design allows numerous installation options. 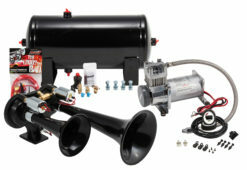 Includes a BlastMaster™ valve upgrade kit that pushes 157.3 dB! Includes a 150 psi, 100% duty compressor, 3 gallon tank, bonus tire inflation kit with storage bag & all parts needed for installation. Easily powers your horns & accessories like air bags and small air tools. Our biggest train horn kit! The Demon™ Model 730’s massive & detachable XCR 2.0™ spun steel trumpets 18.25”, 14.75” and 10.5” in lengths. These allow tons of installation options. 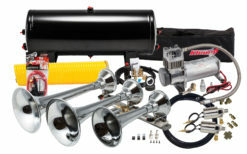 Includes a high output 150 psi, 100% duty compressor, 5 gallon tank and tire installation kit with storage bag. You can power your horns as well as other accessories like air bags and small air tools. For the clinically insane among you, the 730 can be upgraded by adding an Ultra BlastMaster™ valve upgrade (P/N 6890) – making it the loudest, largest and most aggressive train horn on the market. Our biggest train horn kit! The HK9-Slimline has all the same features as the HK9 kit but includes a slim design 3-gallon air tank and not the larger 5-gallon tank. The slim design tank offers more mounting options on small and mid-size trucks and SUVs. The Demon™ Model 730’s massive and detachable XCR 2.0™ spun steel trumpets (18.25”, 14.75”, 10.5”) allow tons of installation options. Includes a fully submersible waterproof high output 150 psi, 100% duty compressor and tire inflation kit with storage bag. The 730 can be upgraded by adding the Ultra BlastMaster™ valve upgrade (P/N 6890) – making it the loudest, largest and most aggressive train horn on the market.